Saturday November 24th 1883 I helped with the work most of the forenoon Hatt came over with both the children Mother was to town a little while. I finished Ediths stocking and made May an apron. I was very sleepy so went to bed early. Sunday November 25th 1883 I was busy about the home all the forenoon. I wrote to Will in the afternoon. We were all visiting together here at home in the evening Some of the folks got caught in a shower. 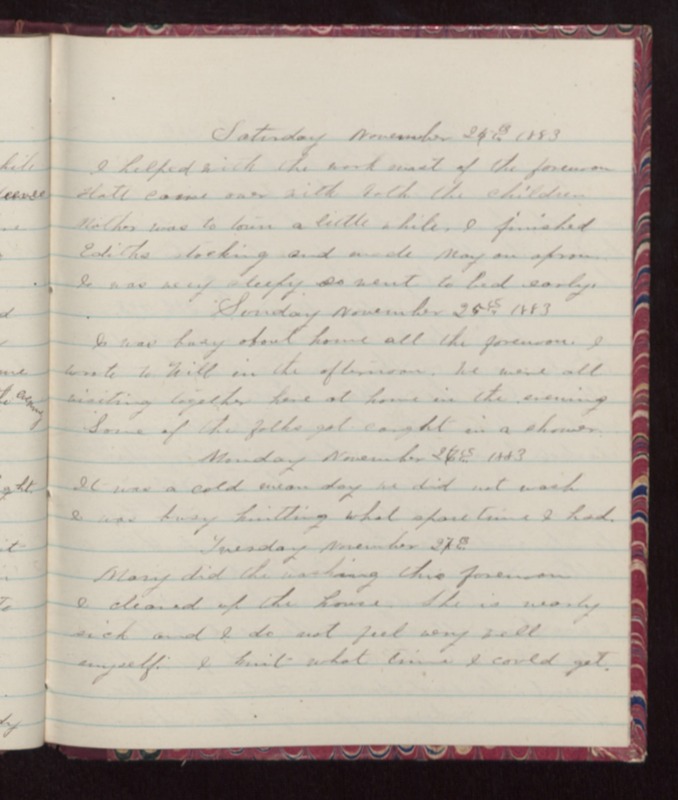 Monday November 26th 1883 It was a cold mean day We did not wash I was busy knitting what spare time I had. Tuesday November 27th. Mary did the washing this forenoon I cleaned up the house. She is nearly sick and I do not feel very well myself. I knit what time I could get.